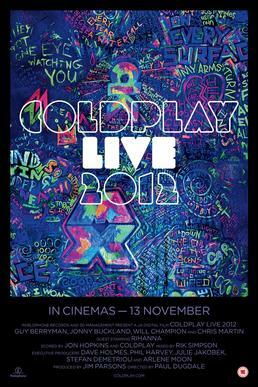 Coldplay’s Live 2012 (the band’s first concert film since 2003), is a visual and aural experience unlike anything attempted during the group’s previous treks around the world. Coldplay Live 2012 was filmed in Paris, Montreal, and Glastonbury and was directed by Paul Dugdale, fresh from recently lensing Adele’s Live at The Royal Albert Hall. Coldplay Live 2012 documents the band’s current and massively successful Mylo Xyloto Tour, which is still in the midst of galloping across the globe. The tour, which is the band’s most dazzling spectacle yet, is meticulously captured here on this live DVD/CD/Blu-Ray and undeniably demonstrates Coldplay has matured into world class live performers. Raising the bar by leaps and bounds above their previous outings, Coldplay Live 2012 is destined to go down in music history as the moment when the band fully hit its stride. Rich with larger-than-life performances (most notably “Yellow” and “Charlie Brown”) ranging from intimate theatres to gargantuan sold out stadiums, the tour film is a visual color-fest highlighting the band’s luminous paint-soaked stage and featuring throngs of passionate fans drenched in neon confetti and armed with computer controlled, multi-colored, LED wristbands. The film also incorporates black and white documentary style footage (divided equally between each group member), which profusely enhances the experience instead of merely being an inessential diversion. Coldplay’s Live 2012 succeeds in creating what U2 attempted to achieve with Rattle and Hum. Although Coldplay will be on hiatus in 2013 before beginning work on their sixth studio album (tentatively scheduled for 2014), this 96-minute concert film (plus the two bonus performances “The Scientist” and “Don’t Let It Break Your Heart”), along with its accompanying live CD, is visually stunning and musically remarkable enough to keep your eyes and ears enthralled for unlimited repeat plays during the interim. Coldplay Live 2012 manages to forever capture the moment when Coldplay rises above mere greatness to become one of the world’s best live acts. For those not fortunate enough to possess a ticket to the Mylo Xyloto Tour, this is the next best thing to being there for all of whom are willing to eagerly follow the band’s musical evolution. Coldplay Live 2012 may very well be considered paradise indeed.